Six years ago, DelhiPlanet published a first hand account of a mythical science commonly known as Naadi Astrology. That feature went on to become a rage receiving more than 350 comments and tens of thousands of page views in the years to come. The success of describing our experience with Naadi Astrology encouraged us to dig deeper into it. In the process we personally investigated various other chapters which elucidate different aspects of our lives in more detail. As a result of these efforts, DelhiPlanet is today the leading source of verified first hand information on Naadi Astrology. Armed with several years of experience and knowledge about the purported science, we sought to conduct a two fold experiment with the goal of understanding the real truth of Naadi Astrology. Do the Naadi leaves truly contain the complete detail of our future? or Is it only an estimation based on insights gleaned from a person’s birth chart? Our first experiment involved verifying the future predicted for one of our team members in 2007. An experience which led us to publish our first feature on this topic, Naadi Astrology â€“ Opening The Leaf To Your Future. To verify the predictions given by the Nadi reader we simply compared the account of events which he described against the reality six years later. The results were not encouraging, the Naadi reader had accurately described the events of the next one or two years although they were referenced to in a vague and general fashion. However, everything that he described beyond two years didn’t happen. Either the prediction proved wrong or the timing was off and the described event hadn’t taken place yet. To understand this further, we consulted a traditional Indian Pandit and asked him to predict the future of the same person after only providing his date of birth, place of birth and time of birth. These details allowed the Pandit to prepare the individual’s birth chart which he then used to describe the future. 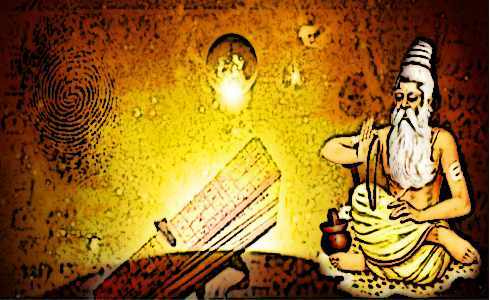 What we discovered through this experiment was that the Pandit’s prediction closely matched that of the Naadi Astrologer. The key difference here was that Naadi Astrologer had detailed what events would happen in which year, while the Pandit had only provided time frames. This led us to believe that the entire goal of a Naadi Astrologer is to determine your name, place of birth and date of birth post which he proceeds to make a birth chart allowing him to predict your future like any other Pandit would do. What makes Naadi Astrology appear more authentic however, is that they provide you with a lot of information about your family, your background, your profession, career aspirations etc. These details are however given to the astrologer by the person themselves through a series of questions. The second experiment involved re-visiting the entire Naadi Astrology process at a different Naadi center for a close relative of the person who was examined in 2007 (as shown in the above video). By now, our team was really familiar with the process of determining a person’s Naadi leaf having gone through it many times in the past. This time, everything was very closely monitored and the setup was carefully observed. It is a common fact that each one of us is greatly impacted by the lives of our close family members, namely parents and immediate siblings. Even our uncle’s, aunts, cousins etc play a role in determining how pleasant or unpleasant our experiences can be in the future. Thus, by determining the future of the parent of the person examined earlier we would be able to check the accuracy of the predictions made in the past. The thumb-print of the parent had been given at the Naadi Center more than a year ago. Finally they were called to visit the center and verify the found leaf. The process started in the same manner as before, the Naadi reader asked a number of questions with the goal of finding a sequence of consecutive ‘yes‘ responses. These queries started out as being vague before becoming more specific, some of the questions asked were; “Is your father alive? Is your mother alive? How many characters are their your parents name/ your name/ your husband’s name? Were you born in the first 15 days of the month? What’s the occupation of your children etc?”. The questioning went on for almost an hour during which almost 200 questions were asked. Once again, similar to our previous experiences, the leaf with most of the matching details was found in third bundle of leaves. Each bundle has 108 leaves meaning that it took the Naadi reader almost 250 leaves to finally arrive at one where everything he said was matched by a ‘yes‘ response. Another interesting observation was that the reader would often repeat the same question he had asked earlier. This made us believe that the entire process was simply a way to extract the information from you through a series of confusing and scattered inquiring. The process ends when the three most important details namely, your name, date of birth, place of birth and time of birth have been identified. Thereafter the Naadi reader asks you to wait for a good one hour during which time he prepares your birth chart and records all your responses in writing. Before you pay the fee associated with the above process, the Naadi reader will read out the future to you as written by him on his notebook. Here again, what we found to be really fishy was that the Naadi reader was simply reading out all the positive responses he had gotten from us. He didn’t tell us anything new. When specifically questioned on certain areas his responses were similar to what the Pandit had given indicating that he too was only predicting your future based on your birth chart. Finally, when all discussion had ended the readers suggested extremely complex religious remedies that would help solve many of our problems. The remedies were very expensive and the establishment simply wanted you to give them the money in return for Prasad which would be delivered to your house. This thorough investigation and two-fold experiment helps us to summarize a few findings although there are still some doubts for which we don’t have answers yet. Please note that everything stated above is an account of our experiences with Naadi Astrology. The illustrated findings are also based on our own investigation and analysis. This may or may not match your experience with Naadi Astrology. We encourage our readers to share their experiences and verify the predictions given by a Naadi Astrologer with another source. This will help to unearth the real truth of Naadi Astrology. Nadi Shastra is precious gift of Agasthya Mahamuni and rest all sages to the Human beings. There are no doubts there are some cheater nadi reader now a days as per Kaliyuga’s rules. This cheating is a part of either testing or related to your Karma. But, if you really sincerely pray to Mahamuni with full of devotion and surrender HE will definitely help you and guide you anyhow. I happen to visit a Naadi astrologer in Delhi Katwaria Sarai. He took me through a long questionnaire didn’t tell anything that happened in past but went on to predict that in coming days I AM GOING TO LOOSE MY JOB, ME AND MY FAMILY WILL BE Involved IN ACCIDENT WHERE I MIGHT LOOSE ONE PART OF BODY, MY CHILDREN EDUCATION WILL BE STALLED AS I WILL HAVE NO INCOME, MY WIFE WILL GET CANCER. But none of this will happen when he persuaded me to open chapter 13 wherein he read the remedy as I HAVE TO PERFORM POOJA OF MY LEAF AND GIVE 48 DAYS INCOME AS DAKSHINA TO HIM. APART FROM THAT I HAVE TO PERFORM SOME POOJA AT A TEMPLE IN TAMILNADU. BUT THIS CAME WITH RIDER THAT UNTIL I PERFORM THE POOJA OF THE LEAF AND GIVE HIM DAKSHINA OF 48 DAYS INCOME (WHICH COMES AROUND 6 LACS) NO OTHER REMEDY WILL WORK EVEN IF PERFORMED. My question whether this is a remedy at all prescribed under NAADI ? Any true naadi acharya is free to answer. can the science of NAADI jotish be trusted in view of such incidence. This is really seems like a cheating from reader and request you to provide us the number and address of such reader we will take further action on those. As due to such cheater many lost faith on our very precious Shastra given to us by our Rishi Muni. 1 . Your mother father, spouse and your name. In case you do not any genuine reader then please reply I will provide you more details. This is my humble request to DO NOT LOOSE FAITH ON MAHARISHI….JUST SURRENDER AND PRAY FROM BOTTOM OF HEART FOR GUIDANCE. 14A, DDA, MIG Flat, Phase1, Near Mother Dairy Booth, Katwaria Sarai, New Delhi, Delhi 110016. Naadi astrology is quite significant in astrology and there are very few posts written on it.I loved reading this post and so would others. Naadi astrology is an authentic concept and people must read about this at least once. This post is really worth reading. I consulted THREE NADI ASTROLOGERS – 1st in Bangalore, 2nd in Guruvayoor, Kerala and 3rd in Vaithiswaren Kovil, Puducherry. To the 1st one in Bangalore, I gave my date of birth and the ‘Astrological Chart’ of planetary position from MY HOROSCOPE written a few weeks or months after my birth. Then the astrologer or Nadi reader did not go thru the usual YES or NO questioning procedure, but just predicted many things of my life and they were mostly true and very similar to that in my HOROSCOPE. Based on this experience, I presume the Nadi reader from Bangalore is an authentic astrologer. The other TWO – one in Guruvayoor and another in Vaithiswaren Kovil did the long questioning exercise and finally WROTE DOWN WHAT WAS EXTRACTED FROM ME FROM THE MANY QUESTIONS I WAS ASKED AND ANSWERED MY ME. I think the thumb impression taken and the reading exercise are JUST AN EYE WASH AND TO IMPRESS EASY BELIEVERS. But it seems there are genuine NADI READERS AS WELL! Sorry for the late reply; only now I saw this request. Just now I don’t have the address of the Bangalore Nadi Reader. But I have seen his address on the internet when I searched Nadi Astrology Bangalore or similar. If you still want it from me, please send an email to: a(dot)karammel(at)yahoo(dot)com. Irrespective of what the author thinks or validated, knowing future using thumb lines is possible. Just google “middle east boy predicts future using thumb print computer software”, a boy developed a software which can accurately predict future of a person for next 5 to 6 years using thumb impression. It is just science, not blind faith. Why the palm leaves are not withering? Palm leaves are rewritten by chola and other kings to preserve the knowledge. If you don’t know, google and find the history of the leaves. There is a big team, who takes care of these leaves and they rewrite the leaves. Why not use books today? I don’t know, you should ask them. There are some idiots, who try to read something and loot people but there are genuine people too. can you please share the genuine people location details. also please share the software name and where it will available . Astrology was never meant to predict future. Astrology only gives an indication what kind of situation you may face or pass through so as to caution you. The outcome depends on you, your faith/belief, your truthfulness, and on a Higher Force (God if you believe). Nothing or no one can predict the future. We can predict our date of birth and exact time via horoscope chart. What am trying to say was. Naadi astrology was a compass given by our ancestors to show a direction in the ocean like life. Because of lot of naadi astrologers who misguide us with false facts for money. Few genuine people getting the bad name too. its up to their naadi community to take action on those money minded frauds. Okay.. But they told everything literally without me giving the horoscope, it’s not a compass… Cheaters are there in every field, doctors, engineers, lawyers, etc.. It’s up to us to go to the right person or to even able to identify whether the person is genuine or not by the way he behaves… I have seen 5 full chapters and I strongly believe in it..
PS: I never believed all these in the beginning, I accepted the truth and I am happy with how gifted we are… I even recommended some of my friends and they too gotta see it.. 🙂 And they too trusted the person whom I suggested…! If we are dumb enough, dumb professionals will be there in every field..! I have also checked all gaandams, i checked for sissy as well. Even my father, uncle all found their soulmate via naadi. i believe it as well. And found my soulmate via it now. it is accurate. All i am trying to say was, we should not blindly believe on that. Just use it as a tool to find a direction to reach the destination. Also, just because of few frauds, lot of genuine people getting bad name. hi can you give me naadi center address? Perur – Coimbatore – Tamil Nadu. Pink building – on the road (towards Karunya) – opposite to temple – near to ATM – wriiten on board – Agastya Nadi Jothida Nilayam. 1st floor. They say that a ‘Rishi’ wrote the future of all the human beings and their future births on leaves or which some call as ‘Akashic records’ and these nadi or other spiritualists claim to access that which is written. If the Rishi was so knowledgeable why did he not suggest the steps a human can take to avoid future births and attain salvation in just one single birth. Dear friends, we were born with intelligent brains but unfortunately these brains have been hijacked by the promoters of religion and faith in different ways so that their own present and future is secured. Whether God really exists or the concept of God exists is a subject of research however for those who believe in God..
Only one change in perspective may help us all…. “Are we God fearing people or God loving”. This can show us the way to take right action for own future. I have been to 3 diiferent centres all predicted totally different lives for me, very confusing. Can any body suggest me a good Nadi Astrologer. I am very worried for my son’s education. Why worry, what will be will be, watch 3 idoits it will make you realise encourage your son to do something he enjoys and not what he is expected to do and he will excell. It’s beyond comprehension of science and logic (still grey area? ), it’s more like probabilities? For sure gullible will get milked through remedial measures they suggest. The questioning session is crucial, they could extract more info. not only verbal, they have keen observation of body language too.